As is typical of my Anime-watching ways, it’s what lies just beyond the usual plot elements that most people look forward to in Anime shows that particularly interest me here. As is typical of Anime from Studio Trigger, Little Witch Academia is filled to the brim with symbolism and esoteric references that will usually go over most people’s heads. For example, Chariot’s “Shiny Rod” possesses seven nodules — seven being the number of the divine — arranged in the shape of the Big Dipper — a constellation considered by some ancient cultures to resemble a wagon/carriage, hence Chariot’s own name by analogy. Alcor, Chariot’s pet bird, is one of Mizar’s three companion stars, where Mizar (in Arabic refers to a cover used for wagons) is a Chikadee in Mi’kmaq lore (Alcor is the Chikadee’s cooking pot). Other cultures have seen the Big Dipper as rod-like, hence the wand itself. Little Witch Academia is an Anime Harry Potter, in many ways. Several of the characters have names that map their character — the best example of this being Diana, whose silvery hair symbolizes the Moon and whose purpose, as decreed by her family, is to perform an important ritual on a very important Full Moon. 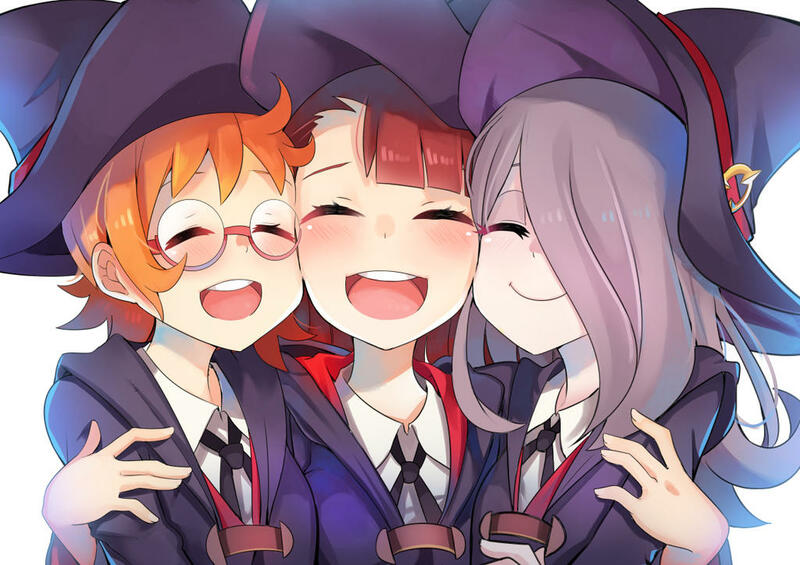 The main protagonist, in this case Atsuko (“Akko”), has two best friends who follow her everywhere and help her out whenever possible (note also that Akko has Harry’s dark hair, Sucy has Hermione’s dirty-blonde hair, and Lotte has Ron’s flaming red hair — even Akko’s “rival,” Diana, has Draco’s silvery hair). Finally, Akko, like Harry, is raised in the non-magical world and so comes into the magical world completely clueless as to what this other world is all about. To prevent further potential spoilage, I’ll leave you all to watch the show itself to experience the rest of what this show has to offer you — which is an awful lot. Enjoy! Never forget: Believe in yourself. That is your magic!